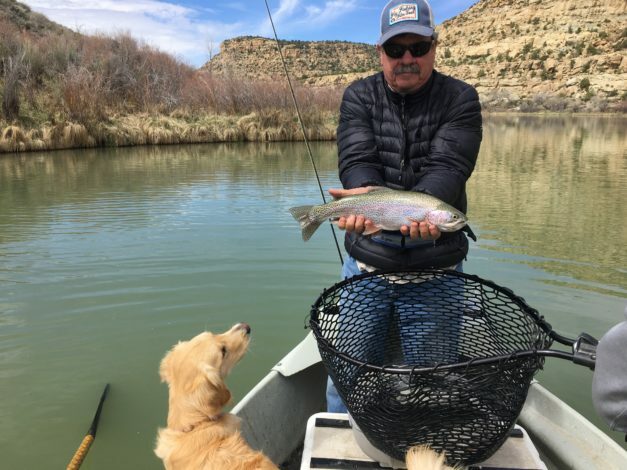 As we settle in for the holidays, one of the things we’re always thankful for are the furry friends who we meet in fly shops and who often accompany us as we go fishing. Last year we celebrated them with a “Fly Dogs” post and we’re reprising it again in our 2017 edition, Fly Dogs II. We ran into many beautiful canines on our Ramble this year, but we decided to highlight these five. We always love it when we walk into a fly shop and are greeted first by the shop dogs. 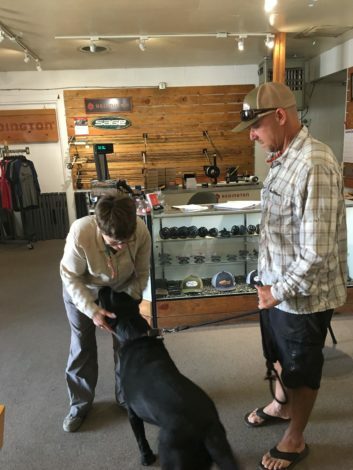 It was no exception when we walked into the Kern River Fly Shop in Kernville (CA) to meet up with Guy Jeans, owner/head guide, who we dubbed “Stonefly Guy” because of his band, Stoneflys. The first to greet us was Jackson Jeans (pic 1 above). Excited doesn’t begin to describe Jackson as he jumped from Guy to Barb to me. We had the same reception at A&G Outfitters in Dickson City (PA). We met Adam Nidoh, our guide to fishing the “Urban Oasis” that is the Lackawanna River, in the parking lot of the shop. When we went inside, we were met by Lucy, the fly shop dog. After she said hello to Barb and me, she went back to relaxing in her favorite spot (see featured pic) as we went off to fish for the day. Fly shop dogs are the best! We met Sammy at the Fisheads Fly Shop in Navajo Dam (NM) as we finished paperwork for our float trip on the San Juan with Chris Taylor, “San Juan Streamin”. Turns out, Sammy jumped in the truck with us and made the float down the river with us as well. Sammy sat and watched as Chris rowed us downstream and sat up each time we hooked and landed a fish, never trying to get to it or getting in the way. She was amazing and so much fun to have wth us. She really liked one of the fish I caught too (see pic 2)! It isn’t just float trips where we have these special friends join us. We met our guide, Matt “Gilligan” Koles, Gilligan’s Guide Service, who showed us the Truckee River, at his home near Truckee before heading out to fish. When we got to the parking spot and got out, he was joined by Elliot. Matt asked us if we were ready to “bushwhack” a bit to get to some great holes, and of course we were up for it. We encountered some great fish you can see in our post, “Gilligan’s Truckee”, but we had a blast watching and listening for Elliott as we waded the river. He kept up with us every inch of the way and dutifully followed Barb and Matt as you can see (pic 3). On our “Driftless Kick!” with Pete Cozad of Driftless Angler, we had the pleasure of meeting Pete’s dog, Teak (pic 4). We watched as Teak ran and jumped to catch the frisbee Pete would throw on the grounds of The Sportsmens Club on the West Fork of the Kickapoo near Viroqua (WI). What was so special was how Teak seemed to hang onto every word Pete was saying during our interview. We’ve included a picture in this post, but to really see how Teak was listening, tune into “Driftles Kick!”. Finally, a reprise of our favorite fly dog, Solomon. 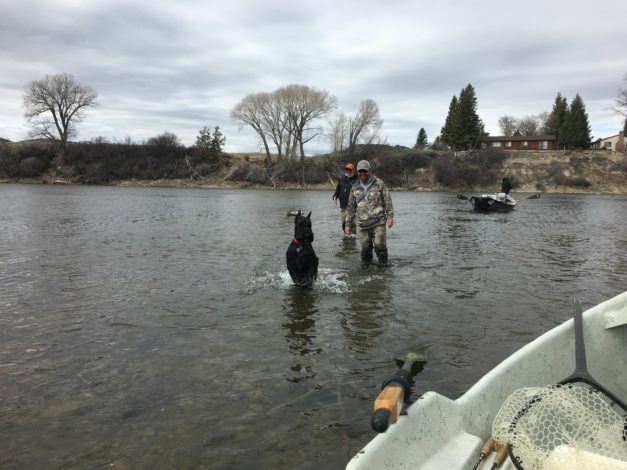 You can see him in our 2016 post, “Fly Dogs” sitting on the welcome mat of TroutHunters Fly Shop in Island Park (ID) on the Henry’s Fork of the Snake. Well, this year was even better. 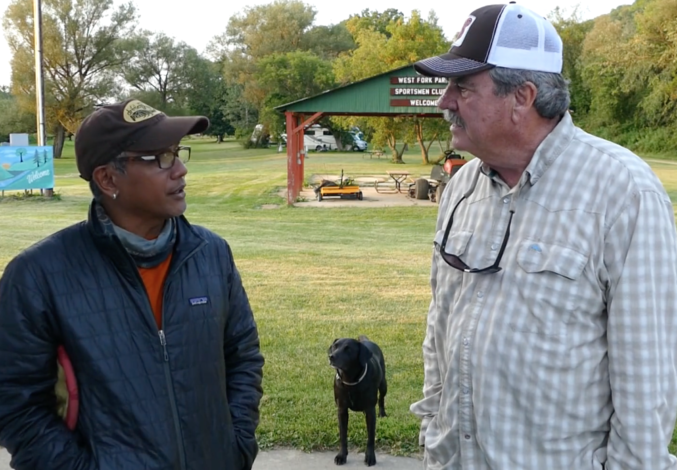 We met Sue and Dud, Solomon’s owners and fishing buddies, to fish the Madison River on our “Madison Redux” with Steve Smith, Rivers Edge Fly Shop in Bozeman (MT). The bite was on and it was an EPIC day of fishing, but what made it so special, was having Solomon with us. Solomon LOVES to go fishing with Sue and Dud, and also LOVES to get in on the action when he can. The picture above (pic 5) is one of our all time favorites. You can see Sue downstream fishing and Dud (red cap) and Steve coming upstream following Solomon, who’d just jumped out of the boat and started running upstream to our boat. Why? Of course, we had a fish on! When Solomon sees a bend in a rod, he’s on it. 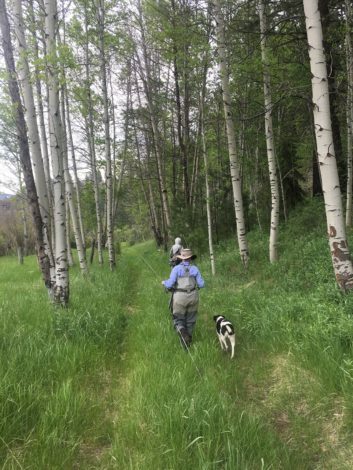 We love fishing with Sue and Dud and always enjoy it when Solomon, our fav fly dog, comes along. I”m sure when we get to Indy for Christmas, we’ll be heading to FlyMasters of Indianapolis fly shop for something. We’re looking forward to being greeted by their shop dogs to wish them a Merry Christmas!